Technology – 2C Tech Corporation, Inc.
2C Tech (Irvine, CA) has been developing a Quantum Dot technology with the intention of delivering a photovoltaic stimulation to the retina in patients with retinal degenerative diseases. Quantum dots (QDs) are semiconductor crystalline structures a few nanometers wide which absorb light, and generate a voltaic response that can be visualized as emitted light of only a strictly defined wavelength. Although they are crystals they behave more like individual atoms thereby QDs are often referred to as artificial atoms; a term that emphasizes that a QD is a single point (zero dimensional) with bound, discrete electronic states, as is the case with naturally occurring atoms or molecules. QDs are biocompatible nanoparticles engineered to be sensitive to energy of different wavelengths (ultraviolet to infrared), behaving more like small solar cells, producing energy in response to light. When excited by light, electrons inside the QD are boosted to a higher level and when electrons return to a lower level QD emits energy as a photon of light. QDs can be precisely controlled as their optoelectronic properties change as a function of both size and shape, material and protective ligand shell coating. The 2C Tech QD has emission peak at 655 nm. Each QD contains a Cadmium-Selenium crystalline core that is encapsulated in a Zinc-Sulfide shell. The material utilizes a dipeptide hydrophilic coating enabling the material to be supplied as a colloidal solution of semiconductor nanocrystals. The combination of coatings are used to protect the core/shell from oxidative damage, enhance the quantum efficacy of the particle and to allow the particle to be suspended in water. Together the coatings act to sequester the heavy metal core from the environment. The Company’s QDs are packaged in a single use conical vial. These particles can be introduced into the vitreous of the eye via pars plana injection, migrate by diffusion through the retina, and eventually are excreted out by normal biological processes. While in the layers of the retina, the particle emissions result in direct stimulation of the photoreceptors, and elicit the release of growth factors that may amplify or extend the duration of effect. The intended result would be a periodically administered treatment that could preserve or enhance vision in patients with these degenerative diseases. When exposed to electromagnetic energy in the form of visible light, QDs can convert light into an electrical impulse (photovoltaic response), which is the key function of the retina. When excited by light, electrons inside the QD are boosted to a higher level, and when the electrons return to a lower level, the QD emits energy as a photon of light. Although they are crystals, QDs behave more like individual atoms, and thus QDs are often referred to as artificial atoms, a term that emphasizes that a QD is a single point (zero dimensional) with bound, discrete electronic states. The zero-dimensional property of QDs gives them excellent transport and optical properties. QDs absorb and emit light of specific frequencies and have a broad excitation spectra and narrow, sharply defined emission peaks that can be precisely tuned by changing the dots’ size, shape, or material. The 2C-QD uses QDs with an emission peak of 655 nm, which has a high extinction coefficient (light absorption). The 2C-QD biocompatible material is delivered via intravitreal injection in a minimally invasive manner and the electrical stimulation is pan-retinal. This direct stimulation is capable of stimulating a variety of neuro-retinal cell types and can prevent cell death in the ganglion cell layer (Watanabe et al. 2002), the inner nuclear layer (Schmid et al. 2009), and the outer nuclear layer (Pardue et al. 2005) which contains cell bodies of photoreceptors. The neuroprotective effect of electrical stimulation is well documented in the literature for diseases as diverse as spinal cord injury, Parkinson’s disease, diabetic neuropathy, and hearing loss. 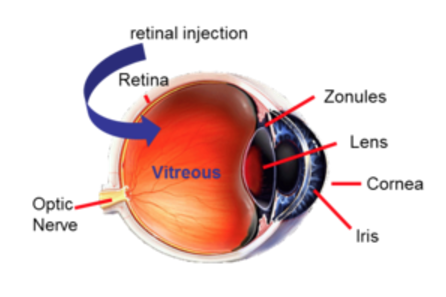 The retina has a limited capacity to regenerate once damaged; it can, however, respond to external or artificial stimulation. Electrical stimulation can induce a cascade of effects, including depolarization of cells which simulates action potential that can restore normal functions. In addition, electrical stimulation, whether chronic or pulsed, may upregulate the endogenous production of neurotrophic factors such as nerve growth factor (NGF), neurotrophin-3, and growth associated protein 43 (GAP-43), and the phosphoinositide 3-kinase- dependent pathway that preserve and prolong cell life (Schmid et al. 2009, Pardue et al. 2005). The methods of delivering electrical stimulation to the retina reported in the literature range from non-invasive transcorneal contact systems, to intraocular implants, to suprachoroidal-transretinal implants. The duration of electrical stimulation has ranged from very brief periods to long-term studies of 5 years or longer. Despite the route of delivery or the length of stimulation, electrical current applied to the retinal consistently demonstrates a protective and beneficial effect, in multiple different animal models and in humans. Independent of Quantum Dots, other types of nanoparticles offer unique properties that make them well-suited for a wide variety of drug delivery applications in both front and back of the eye. Based on composition and coating choices, the nanoparticles off advantages for extended release, targeting and timed delivery of therapeutics that could address significant unmet needs. The Company has filed IP in these applications, and has the ability to access the necessary resources to support pharmaceutical partners that are focused on the capabilities that could be enabled. © Copyright - 2C Tech Corporation, Inc.